Apple has finally released the Apple TV and, thanks to a fortuitously timed vacation by Macworld ’s Editorial Director Jason Snell—fortuitously timed for me, that is—I’m the lucky soul who gets first crack at this set-top box. Over the next several days, I’ll take my first—and subsequent—cracks at exploring Apple TV’s many wonders. In this installment, we’ll look at the first out-of-the-box experience. 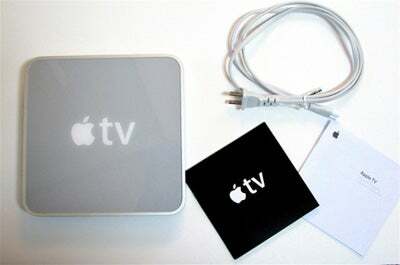 Not included with the Apple TV are any cables for connecting the device to your television. Fortunately, the Apple Store sells both HDMI and digital audio Toslink cables made by XtremeMac. I picked up a couple of the cables at the San Jose, Calif., Apple Store where I purchased the Apple TV. I was very pleased to discover that these things are priced at just $20 a piece. Check your local electronics mart and you’ll discover that HDMI cables are often priced at well over $50. The contents of the Apple TV packaging (sans the included remote). The Apple TV’s footprint is a bit larger than a Mac mini at about 7.75-inches square and just over an inch tall. Arrayed across the back are the Power, USB, Ethernet, HDMI, Component Video, Analog Audio, and Optical Digital Audio ports. The front of the device bears a single light that can flash white or amber. The purpose of all these ports save the one labeled USB are clear. In a Apple TV briefing with Apple Thursday morning, I learned that the USB port is not for users. Rather, Apple will employ the port should you need to return your Apple TV for repair. And I expect that’s true—for now. But I won’t be surprised when one update or another brings other capabilities to that port. I’m as enthusiastic about Apple’s technology as the next guy and because I am, I wanted to get my Apple TV up and running as soon as possible. Apple makes it pretty easy to do just that. I plugged the Apple TV’s power cord into the back of the device as well as into a nearby power receptacle. I unpackaged the XtremeMac HDMI cable I’d bought and strung it between the appropriate port on the Apple TV and one of the HDMI jacks on my Panasonic TH-42PX60U 42-inch plasma TV. I switched over to HDMI 1 with the TV’s remote and, in short order, there appeared the white Apple logo on a black background. Much like when installing OS X, the first thing you see beyond the Apple logo is a Language screen where you pick from among 15 languages using the Apple Remote. When you make selections and press Play/Pause you hear the same cute little “clunk” sound used by Apple’s Front Row. If you’ve jacked a cable into the device’s Ethernet port, it will check this connection first for a viable network connection. If it finds one, it will attach itself to the network using DHCP. If no Ethernet port is present, it then searches for wireless networks using its built-in 802.11b/g/n capabilities. In my case I have a wireless N network setup downstairs using the latest AirPort Extreme Base Station. It found it in just seconds. The Apple TV displayed its name as well as the name of my older G-flavored AirPort Extreme Base Station. I selected the N network and I was in business. After that, the Apple TV wanted to speak with its partner, iTunes. It initiated this process by producing a screen that displayed a 5-digit PIN code. My job was to move to the Mac that would sync with the Apple TV, select the Apple TV entry in iTunes’ Source list, and enter the Apple TV’s PIN in the space alotted. This, too, I did. Within the Apple TV preferences, I was prompted to register and name the device. Once I’d done that, it was time to move to tabs much like you find in iTunes’ iPod preferences. 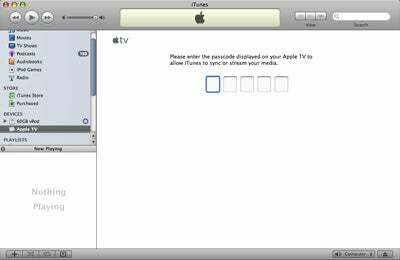 The process of linking up Apple TV and iTunes concludes with you entering a 5-digit PIN code into the space provide in iTunes’ Apple TV menu. You’re allowed to sync an Apple TV’s internal 40GB hard drive with one computer—Mac or Windows PC—running iTunes 7.1.1 or later. When you’ve established that relationship you can tell iTunes what content you’d like moved to the Apple TV’s hard drive. This hard drive contains 33GB of usable storage space. This it will do up to the point where the hard drive is full—something that’s not hard to do if you have a lot of TV shows and movies. 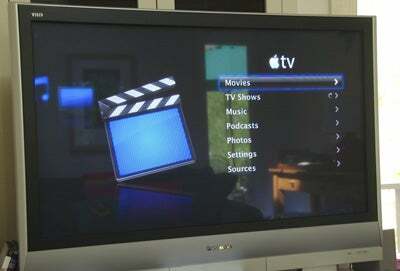 The Apple TV gives priority to your media, first syncing movies, then TV shows, music, podcasts, and, finally photos. When a computer is synced with an Apple TV, you see a tabbed interface where you determine how movies, TV shows, music, podcasts, and photos are synced to the Apple TV. If the hard drive fills up with movies, that’s it, it’s full. Content will disappear from the device as you sync it. For example, if you’ve configured Apple TV to grab the three most recent unwatched movies and you watch one of the movies, iTunes will tell the Apple TV to strike the watched movie from its hard drive and load the next unwatched movie. iTunes and the Apple TV constantly talk to one another. As long as iTunes is running on the synced computer and your network is up and running, the two will update content as necessary; there’s no need for you to initiate syncing. You can choose how many movies get synced to Apple TV with this drop-down menu. As I hinted, you can manage which media winds up on the Apple TV simply by being selective about which content (and how much of it) is synced to the device. For example, you can tell iTunes to sync only the three most recent unwatched movies. Or disable movie syncing altogether so you can sync the five most recent episodes of a TV series. 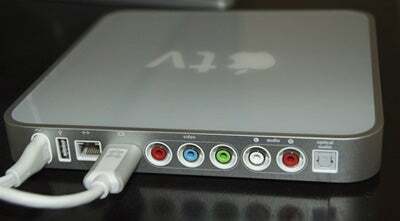 The Apple TV can also stream content from up to five computers. To do so, navigate to the Sources menu on the Apple TV, select Connect to New iTunes, and a new PIN number appears. Enter this PIN number into the Apple TV preferences on the new computer’s copy of iTunes, and iTunes will tell you you’re in sync. You can now stream content from that computer’s library to the Apple TV. You can also stream content from the synced computer. How quickly it streams depends on the speed of your network and the kind of content you’re streaming. If you have an 802.11g or n network, video should stream fairly quickly. Although video can be streamed over 802.11b networks, it’s likely to take a while for that content to be buffered by the Apple TV (meaning there will be a longer delay before playback begins). Audio is supposed to stream nicely regardless of the kind of network you have. A wired network should stream just about anything you throw at the Apple TV. If you’ve used a screen-bearing iPod or Apple’s Front Row, you’re going to feel right at home with the Apple TV. Its menu structure is very similar to Front Row. Once you’ve configured the device, you’ll see the Apple TV’s main screen. In that screen, you’ll see entries for Movies, TV Shows, Music, Podcasts, Settings, and Source. These menu entries do pretty much what they suggest with a few added bonuses. Among them you’ll find an iTunes Top Movies and Theatrical Trailers entry in the Movies screen. Just as with Front Row, you can watch movie trailers streamed from the Internet. And yes, just as with Front Row, they look wonderful and load quickly over a typical DSL or cable connection. Choose iTunes Top Movies and you’ll see a list of 10 titles. Select one and you view a short description of the movie and a picture of its poster. You cannot purchase these movies directly from the Apple TV. They’re there just to offer you the preview—one that runs a couple of minutes. They too look great. Within TV Shows, you’ll find an entry for iTunes Top TV Episodes. Again, there are 10 titles listed and the previews are just that—a 30-second snippet of the program. The Music entry contains iTunes Top Songs and iTunes Top Music Videos entries and displays album covers when you select one. Again, a 30-second preview is offered and the album cover displays when you select a track. Podcasts offers no previews or recommendations, just the podcasts you have in the connected computer’s iTunes library or the podcasts stored on the Apple TV’s hard drive. Settings is where you control how the Apple TV behaves. It includes these entries and options: About, TV Resolution (720p HD, 1080i HD, 480p, 720p HD - 50Hz, 1080i HD - 50Hz, 576p - 50Hz), Network (Configure Wireless, Configure TCP/IP), Screen Saver (Timeout, Use For Music [On/Off], Preview, Logo, Albums, Photos), Repeat Music (On/Off), Sound Check (On/Off), Sound Effects (On/Off), HDMI Brightness (High/Low), Pair Remote, Update Software, Language, Legal, and Reset Settings. And Sources includes four entries—Apple TV, Currently Synced Computer’s Name (the name of your synced computer), Connect to iTunes, and Syncing. Select Apple TV and press Play/Pause and you’re taken to the main screen where you can view what’s on the Apple TV’s hard drive. Apple’s spinning wheel icon appears next to any media type that’s currently being synced (TV Shows, for example). Select the name of your synced computer and Apple TV will establish a connection with it and display the contents of its iTunes library, using the same main screen menu scheme that offers Movies, TV Shows, Music, Podcast, Settings, and Sources entries. Select something within these first four entries to stream that content to the Apple TV. The Connect to New iTunes entry is where you’re presented with the PIN number for a computer you wish to add to your Apple TV. And selecting the Syncing command lets you turn syncing off (doing so removes any synced content from the Apple TV) and change the iTunes Library your Apple TV is synced to. Within this screen you also see a picture of the Apple TV and a progress bar that tells you what it’s up to (the name of what it’s copying to the Apple TV’s hard drive for example). I’m quite literally typing with one hand and operating the Apple Remote with the other so I haven’t had a lot of quality time with the Apple TV and judgments will come later. But I can point out a couple of cool things that have leapt out. The first is that the Apple TV is careful with your display. Wonderful as the device may be, no one wants to see its images burned into a plasma display because it’s projected the same menu or album cover for hours on end. To prevent such damage, it kicks in a screensaver after two minutes (you can change this length). By default it uses some floral images stored on the Apple TV and they’re beautiful. They move gracefully up your screen and, every so often, the images spin around. It doesn’t leave static images of album art on the screen either. When you’re playing music or a podcast, the album/program art appears on screen. After a short while, it rotates so that it doesn’t burn into your display. Nice. And the Apple TV is clever about picking up where you left off. If you halt a movie mid-stream and later return to it after playing some other media, you’ll be asked if you’d like to play from the beginning or take up where you last stopped. If only my DVD player kept track so well. There’s lots more to come as I take my hands off the keyboard, settle into the couch cushions, and spend more time syncing, streaming, and playing the content of my iTunes Library. Stay tuned.